Coxswains were the sailors that piloted the landing craft used in the D-Day assault. LCVPs used at Omaha and Utah beaches were steered by U.S. Navy and U.S. Coast Guard coxswains, while the LCAs used by the 2nd Ranger Battalion were piloted by British Royal Navy sailors. 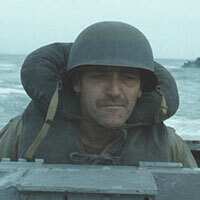 Although the coxswain of Captain Miller's landing craft should have been a British sailor piloting an LCA, the movie's use of American LCMs instead of British LCAs makes an American coxswain more appropriate. It's unfortunate that LCAs were not used in the film as it would have provided a better indication of British involvement in Operation Overlord. Criticism that Saving Private Ryan only shows American forces is largely unwarranted because of the focus and scope of the story, but in this case the use of British LCAs and coxswains would have been realistic and appropriate. This unidentified coxswain is a fictional character. Ironically, actor Ronald Longridge is British and a former Royal Marine.